The Battle of Fort Blakely was the final major battle of the American Civil War. 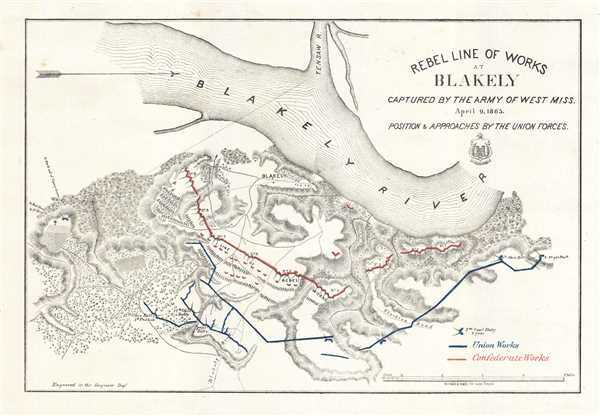 Rebel Line of Works at Blakely Captured by the Army of West Miss. April 9, 1865. This is a separate issue 1865 U.S. Army Corps of Engineers map of the American Civil War Battle of Fort Blakely, the last major battle of the war. Centered on the town of Blakely, Alabama, the map depicts both Union and Confederate fortified positions on one side of the Blakely River. Fort Blakely, situated on the approach to Mobile, Alabama, presented an important objective in the Union's drive to finally seize Mobile. In an effort to present a more complete understanding of the landscape of the battle, the area's topography is indicated by hachure, while both standing and felled trees are illustrated. Most of the Confederate fortifications also had a line of felled trees in front of them as a measure of further protection, per the map. Several roads are depicted, including the Blakely Road and the Stockton Road. The Battle of Fort Blakely took place only a few hours after Union General Ulysses S. Grant secured Confederate General Robert E. Lee's surrender at Appomattox, Virginia, making it the last major battle of the American Civil War. Union forces had laid siege to the fort beginning on April 2, with the final assault taking place in the early evening of April 9. Due to sheer overwhelming strength, the Union attackers easily breached the Confederate earthworks and forced the Confederates to surrender within thirty minutes of the final assault on the fort. On April 12, Union forces finally occupied Mobile, Alabama. This map was produced by the U.S. Army Corps of Engineers and published in 1865. LOC G3974.F624 1865 .U52. Stephenson, R. W., Civil War Maps; an Annotated List of Maps and Atlases in Map Collections of the Library of Congress, 104. OCLC 605169942.